We have limited availability for boarders and training horses! Contact us today! 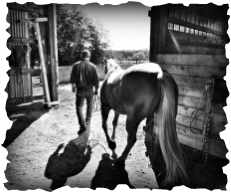 Every horse has a job to do: it might be trails, ranch work, high calibre competition, minding the kids, sorting cows, or being a faithful friend. Some horses have to do all of these jobs in their lifetime! As you improve and learn as a rider, you will encounter new ideas, new challenges, and new tasks along the way. Using Natural Horsemanship and a deep understanding of how the horse thinks, Chase Hill can give you and your horse the tools needed for a solid partnership: confidence, trust, respect and patience. Your horse can become the best he can be at his job: working with you, not against you. If you think we can help you and your horse, don't hesitate to get in touch. Chase made us a match today! It was great getting to watch you work on Wrangler a bit, you have a gift! You found a great horse for a super stoked 14 yr. old and we look forward to some fun times learning new stuff from a true horseman! Find out more about how Chase can help you and your horse work better together over at our training pages. Treat yourself to something new! Check out our For Sale pages. Chase is currently taking on new clients in Whatcom County and offers competitive rates. Call on (406) 390-0525 or email today! Join our page to keep up to date with all the latest news and offers. All site content © Chase Hill, 2015. All rights reserved.